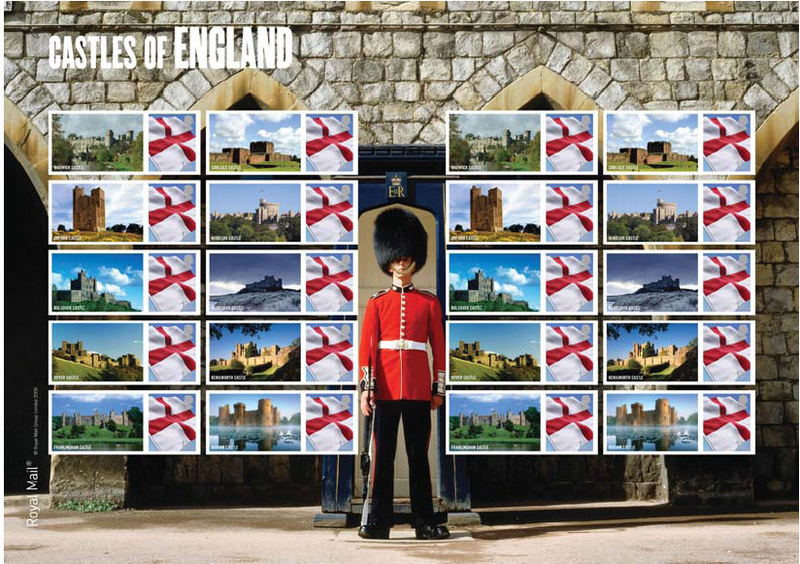 The second in what we assume will be a new five-sheet series of Smilers Sheets following the Northern Ireland sheet, will be issued on St George's Day 23 April and will show Castles of England. 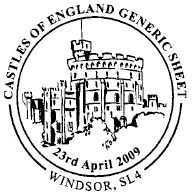 Using the 1st class St George's flag stamp from the Celebrating England miniature sheet the sheet shows 2 panes of 10 English castles. column 1: Warwick, Orford (Suffolk), Bolsover (Derbyshire), Dover (Kent), and Framlingham (Suffolk). column 2: Carlisle (Cumbria), Windsor (Berkshire), Bamburgh (Northumberland), Kenilworth (Warwickshire), and Bodiam (Sussex). Link to Wikipedia list of Castles in England. The A4 (297 x 210mm) self-adhesive Smilers Sheet is printed in litho by Cartor Security Printing - design details and credits awaited. All images are Copyright 2009 by Royal Mail. These postmarks are relevant to this sheet: these may not be to scale. This is not regarded by Royal Mail as a new issue, so there are no official First Day postmarks available. If you want to be lept informed when this page is updated, please use the ChangeDetection panel at the top of the page. If you have any questions on these stamps please email us. NB: all emails will be acknowledged in 1-2 days. If you do not receive an acknowledgement please email us from a different address (eg hotmail, gmail). 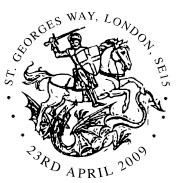 2007 - 2008 2009 stamp issues Visit our online shop!